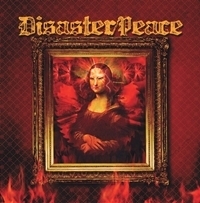 The King Diamond duo Pete Blakk & Hal Patino (played on Them, Conspiracy and the Eye) joined forces with Wade Black (Seven Witches, Leatherwolf and Crimson Glory) to form Disaster/Peace . With Andy La Rocque as co-producer and with a guest appearance, the link to the band King Diamond is complete. It shouldn't be a surprise that the music is a bit in the same style, dark melodies, demonic stories and good guitar solos embedded in heavy songs. You can't compare it to the albums I mentioned earlier, because the songs are much heavier. The raging drums and the heavy riffing together with the vocals of Wade see to that it sounds like an ultra heavy version of Judas Priest. Nothing wrong so far, but there are two reasons why this is not a hammer. First of all, the songs are not all that strong and the second one is the vocals. If you are into good and heavy metal songs in the vein of heavy Brainstorm, King Diamond and Judas Priest's Jugulator, this isn't a bad record. But first check out if you can dig the high whining vocal parts.